A team writing in the journal Nature Geoscience says the 310,000 sq km (119,000 sq mi) Tamu Massif is comparable in size to Mars' vast Olympus Mons volcano - the largest in the Solar System. The researchers doubted the submerged volcano's peak ever rose above sea level during its lifetime and say it is unlikely to erupt again. "The bottom line is that we think that Tamu Massif was built in a short (geologically speaking) time of one to several million years and it has been extinct since," co-author William Sager, from the University of Houston, US, told the AFP news agency. "One interesting angle is that there were lots of oceanic plateaus (that) erupted during the Cretaceous Period (145-65 million years ago) but we don't see them since. Scientists would like to know why." Prof Sager began studying the structure two decades ago, but it had been unclear whether the massif was one single volcano or many - a kind that exists in dozens of locations around the planet. 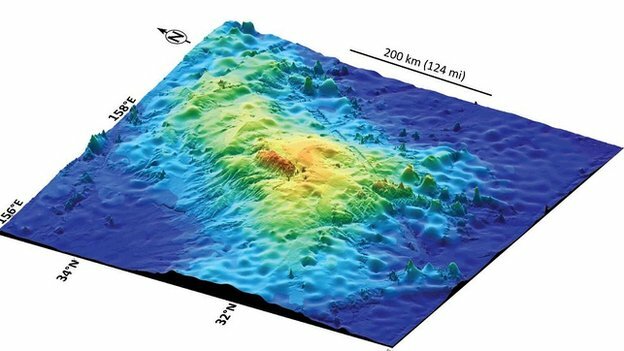 While Olympus Mons on Mars has relatively shallow roots, the Tamu Massif extends some 30 km (18 miles) into the Earth's crust. "We don't have the data to see inside them and know their structure, but it would not surprise me to find out that there are more like Tamu out there," said Dr Sager. "Indeed, the biggest oceanic plateau is Ontong Java plateau, near the equator in the Pacific, east of the Solomons Islands. It is much bigger than Tamu -- it's the size of France."